One week until the coveted "Chicago Craft Beer Week" kicks off, showcasing local craft beer from all of your favorite and 'yet to be discovered' favorite breweries from the Midwest and beyond. 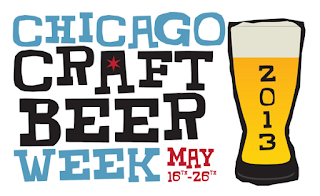 This 11 day celebration is brought to you by the hard working folks of the Illinois Craft Brewer's Guild, a non-profit organization dedicated to promoting the development and expansion of the local craft beer industry. This year's schedule is overwhelming to say the least, with over 250 locations involved. Each day offers dozen's of fantastic events, spanning not only the Chicago area neighborhoods, but expands into many of the surrounding suburbs. In addition this year the ICBG has published a free CCBW app, to help you organize your event schedule as well as check into events to earn points to win prizes, such as beer festival tickets, t-shirts and more. The app can be downloaded here. Below are some highlighted favorites, with the best intentions to hit as many as possible. We of course have to spotlight our own event - Celebrating Real Women of Craft Beer on May 23rd at Riverview Tavern. The ladies behind your favorite local breweries will be in attendance to tap an exclusive all women brewed collaboration beer, "99 Problems" - a Saison brewed with Chamomile and Ginger. We'll be screening the documentary "The Love of Beer". Some would say the most spectacular event to kick off Craft Beer Week featuring all of Chicago’s local breweries pouring beer at the beautiful Garfield Park Conservatory. Ipswich, MA-dness, featuring Boston area breweries Clown Shoes and Brash Brewing. 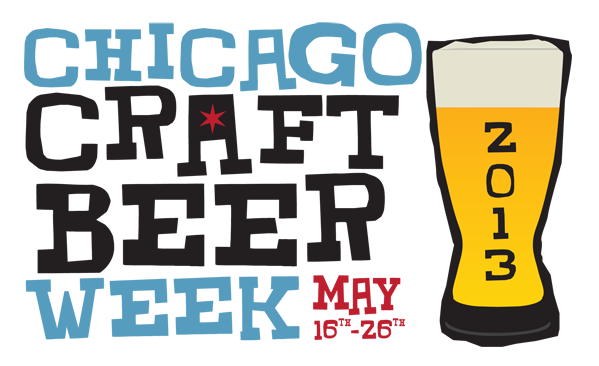 The brewery guys will be in attendance and are ready to rock the Chicago scene. A fabulous night of Two Brothers beers, 80's music, dancing, awkwardness, balloon arches, and polaroid photos! Celebrating of 25 years of brewing in Chicago with a variety of beer including the Fulton & Wood and Bourbon County collections. Viking’s Feast with Solemn Oath Brewing, featuring 8 taps and a firkin of Solemn Oath’s beer, paired with Viking films and Nordic Metal music. Celebrating Women in Craft Beer, featuring the female brewers of the Midwest from Goose Island, Two Brothers, Rock Bottom, Metropolitan, Greenbush, 4 Paws, Ale Syndicate, Flossmoor Station as well as Bottles & Cans beer store, with an exclusive all women brewed collaboration beer. Beerfly Alleyfight - Watch 10 homebrewers compete with the same beer recipe paired with a food dish and a local artist performance. Sample food, beer & art!